Until a few decades ago, there was limited public and scientific interest in the West concerning the properties, correlates and applications of mindfulness. However, mindfulness is now arguably one of the fastest growing areas of mental health research. 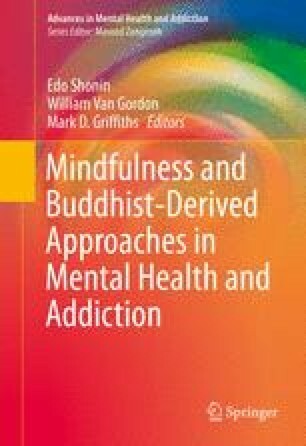 The first part of this chapter summarises some of the key developments in mindfulness research and practice within mental health and addiction settings. The chapter continues by providing a chapter-by-chapter overview of the various themes and subjects explored in the current volume. Shonin, E., & Van Gordon, W. (2015). Managers’ experiences of Meditation Awareness Training. Mindfulness, 4, 899–909. doi: 10.1007/s12671-014-0334-y. Van Gordon, W., Shonin, E., & Griffiths, M. D. (2015b). Towards a second-generation of mindfulness-based interventions. Australia and New Zealand Journal of Psychiatry, 49, 591–591. doi: 10.1177/0004867415577437.